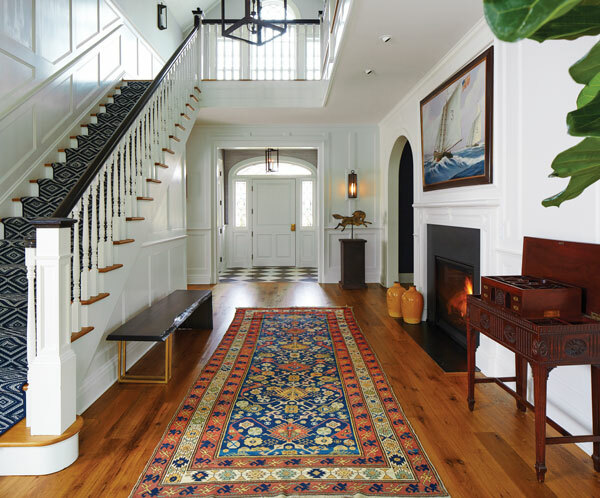 The foyer is a juxtaposition of old and new with an antique Caucasian Kuba rug flanked by a contem­porary live-edge wood bench with brass legs on one side and an 18th century Chinese gentlemen’s dressing table. A galloping horse weather vane, borrowed from the Monmouth County Historical Association, provides interest in one corner. Above the fireplace is a traditional painting of a sailboat. 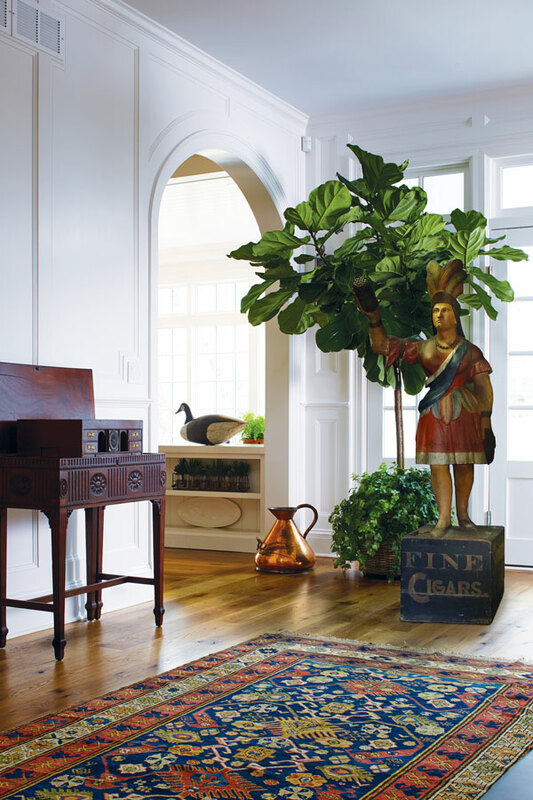 At the other end of the foyer, Goldfarb placed one of the larger primitive pieces—a cigar store Indian attributed to Samuel Anderson Robb, a leading carver of trade signs. It’s the focal point of the space, Goldfarb says. The rug colors—ochre, blues and greens—work perfectly with the Indian. Additional accents include a copper antique beer mug and, just beyond it, an antique goose decoy, both from the designer’s collection. A striking blue paint covers the walls of the great room. Here designer Barbara Goldfarb created a window seat for extra seating. The coffee table ottoman is covered in a blue-and-gray plaid, and the swivel chair is a gray linen-like fabric. 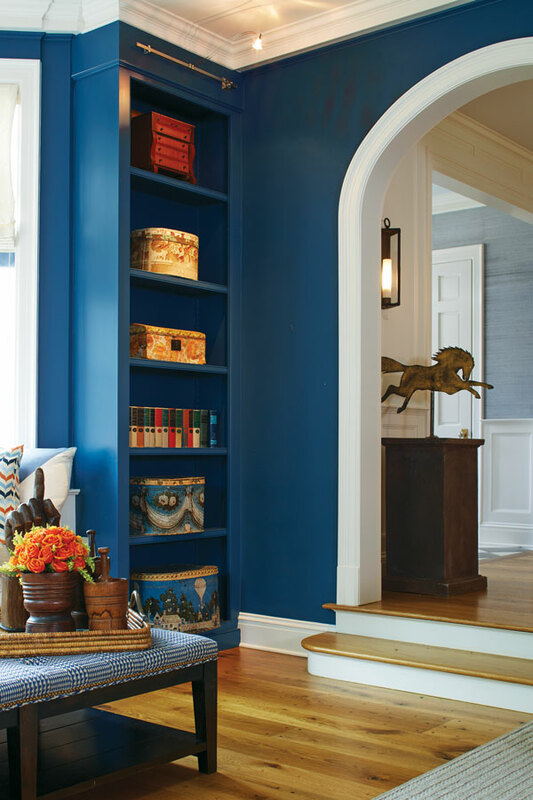 Built-in bookshelves hold an interesting collection of antiques, including colorful hatboxes, a child’s miniature chest of drawers and miniature children’s chairs. The antique galloping horse weather vane in the foyer can be seen from the great room. The young homeowners chose Federal-style architecture for their home to render the look of a historic house. The foundation and one exterior wall (not shown) is Pennsylvania fieldstone from Bucks County, Pennsylvania. The front door surround is elegant leaded glass, custom made by artisan glassmakers and based on historic designs. The designer placed an American classic—a barbershop pole (circa 1875 to 1900) painted red, white and blue with gold accents—in a prominent place in front of a window in the dining room. Opposite it is a horse and sulky weather vane (circa 1890 to 1900) crafted by the J.W. Fiske Iron Works of New York City. The furnishings are eclectic: a Georgian pedestal dining table is flanked by chairs with leather backs and faux pony skin seats. Two distinctive pieces of artwork are set against a navy hemp wall covering: a whimsical cow painting and an antique 13-star private yacht flag (circa 1865 to 1890) made by Annin Flagmakers, a historic company dating to 1847. A sitting area off the kitchen has a large blue sectional that ties in with the blue of the table and chairs in the adjacent dining area. A blue and white dhurrie rug delineates both spaces. Details make the difference. Clockwise from far left: American mortars and pestles (circa 19th century to early 20th century) are from the designer’s own collection. They occupy a spot on the great room coffee table ottoman along with a late 19th century-early 20th century carving of an American wood hand trade sign. • A closeup look at the barbershop pole (circa 1875 to 1900) in the dining room. • An antique Delft tobacco jar with a brass lid sits on the table in the dining area off the kitchen. • This horse and sulky weather vane (circa 1890 to 1900) is made of cast iron, molded copper and tin. The table and benches in the dining area off the kitchen are reproductions based on historic designs. The table, inspired by an antique chair table, has a base covered in blue milk paint and a top made of original granary boards. Reclaimed barn wood was used to make the 18th century-style American benches, which are linked with remov­able pins to create a banquette. The con­temp­orary chairs at the table are rattan. A cast iron boot-shaped trade sign (circa 1850 to 1900) takes its place in a corner, while an antique wood keeler (a broad, shallow tub) sits on the table flanked by antique Delft tobacco jars with brass lids. Built-in cabinetry in the master bedroom holds a collection of antique duck decoys. Goldfarb says they are an example of a grouping that becomes a powerful design element. 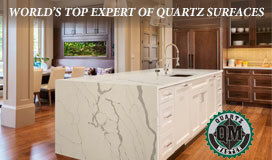 An Amish child’s quilt also occupies a prominent spot in the cabinetry. Goldfarb created a serene space in the understated master bedroom done in pale blues and grays. The upholstered headboard has distressed nail heads. The chests, imported from India, are custom bone inlaid in a herringbone pattern. Wall-mounted fixtures hang over the chests. A designer incorporates antiques into a contemporary home, creating a unique space linked to our historic past. In our disposable age when the “new” is almost always considered good and many historic houses have been lost to the wrecking ball, antiques can play an ever more important role in our homes. The designer found the perfect opportunity to put that philosophy into practice with her design of a home located in Rumson, NJ for a young family. 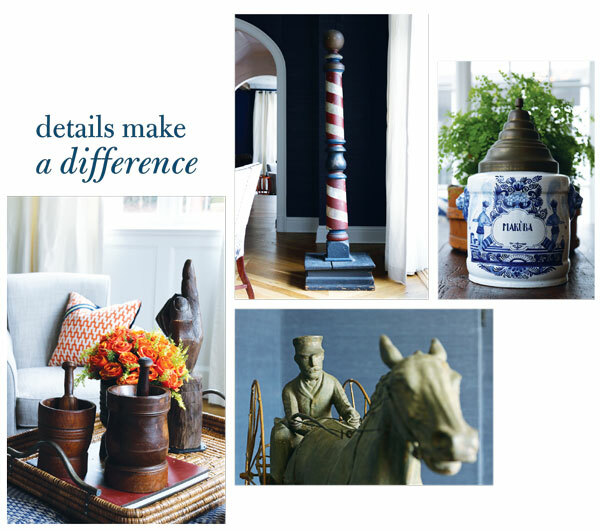 Her idea: to demonstrate the value of antiques by incorporating them into the couple’s contemporary home. “I had recently worked on this project but it wasn’t complete and I knew the owners loved Americana,” Goldfarb says. So the designer worked with Joseph Hammond, curator of the Monmouth County Historical Society, and Kara Short, a trustee of MCHA and former co-chair of the Two Rivers Antiques Show, to borrow several pieces from its collection to place throughout the home. “The MCHA was happy to show off some of its iconic pieces,” Goldfarb says. And because several pieces she wanted to select were unavailable, she and Short contributed some antiques from their own collections. The backdrop for the antiques is a fitting one. Goldfarb says the homeowners, originally from Bucks County, Pennsylvania, have an appreciation for historic homes. While many homes in the Rumson area are gray shingle-style houses, the couple wanted something different. Their new 8,000-square-foot home was built in 2014, but it was designed to look like a historic structure. Using images selected by the homeowners, Anderson Campanella Architects of Rumson designed a Federal-style home with a classic exterior and a spacious, light-filled interior ideal for this active young couple and their three children and two dogs. Goldfarb selected mostly primitive antiques—primarily American, French, Italian and English—for the home. “They work very well with contemporary spaces that are open and have a lot of natural light,” she says, “and where they become the focal point or ‘art’ of those rooms.” Primitive pieces also are already distressed and require little care, an important consideration for families with young children. The designer herself used primitive antiques in her own home when her children were young; the house was filled with their friends and she didn’t want to worry about highly polished surfaces. The wide range of objects Goldfarb chose for the Rumson home included weather vanes, decoys, mast heads, rugs, Amish quilts, wood bowls, and primitive tables and blanket chests. With that in mind, she placed an imposing tobacco store Indian and a beautifully detailed antique dressing table in the foyer. The Indian (circa 1877 to 1910) is attributed to Samuel Anderson Robb, an American sculptor best known for his carved wood figures for tobacco stores and circus wagons. The gentlemen’s dressing table was brought from China in 1797 by Charles Haight, who served as supercargo (a representative of the ship’s owner on a merchant ship) aboard the Woodrop Sims sailing between Phila­delphia and China in 1796. The foyer itself is a juxtaposition of old and new. The rug is an antique Caucasian Kuba, and it’s flanked by the Chinese gentlemen’s dressing table and a contemporary live-edge wood bench with brass legs on one end. Distressed copper lanterns provide light: a triangular one just off the front door, a sconce on the foyer wall and a square one hanging in the foyer proper. Another antique—a galloping horse weather vane (circa 1820 to 1850)—graces one corner of the space. The floors here and throughout the home are custom random-width oak planks distressed to look original to the period. In the dining room, another large piece—a classic American barbershop pole painted red, white and blue with gold accents and a gold ball at the top—sits in front of a window. Opposite it is a horse and sulky weather vane (circa 1890 to 1900) made of cast iron, molded copper and tin; it’s the work of J.W. Fish Iron Works in New York City.